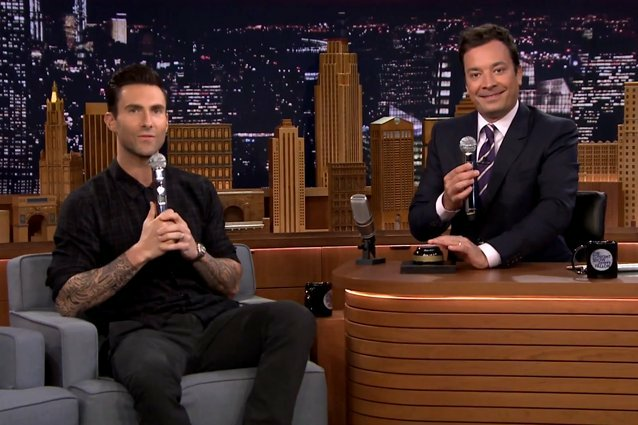 Jimmy Fallon Takes Adam Levine On In "Wheel of Musical Impressions"
Jimmy Fallon likes to have fun on The Tonight Show with lip-syncing and impressions. It’s not at all surprising that he’s done it again and made us all cry with laughter, with the help of Maroon 5’s lead singer, Adam Levine. Somehow this new game, “Wheel of Musical Impressions,” makes us want a full recording of “Head, Shoulders, Knees, and Toes,” by Levine. That Michael Jackson musical impression is easily the greatest impression we’ve ever seen of the King of Pop. Hopefully Fallon continues this sketch, with Levine as his guest, over and over again.